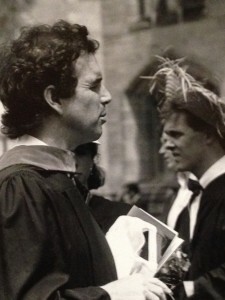 Garry Trudeau (left, Class of 1970), Class Day speaker, May 1991. Photograph by Mike Marsland. RU 690, Accn 2009-A-070, Box 12. With Yale’s Commencement 2016 just past, and the appearance of crowds of Yale alums and their loved ones celebrating reunions over the next two weekends, we thought we’d take a look through the collections in Manuscripts and Archives and see what was going on in 1991, since the Yale College Class of 1991 is holding its 25th reunion this year. Yale’s senior class gets to invite someone to address them on Class Day, which occurs on Old Campus the Sunday before Commencement each year. 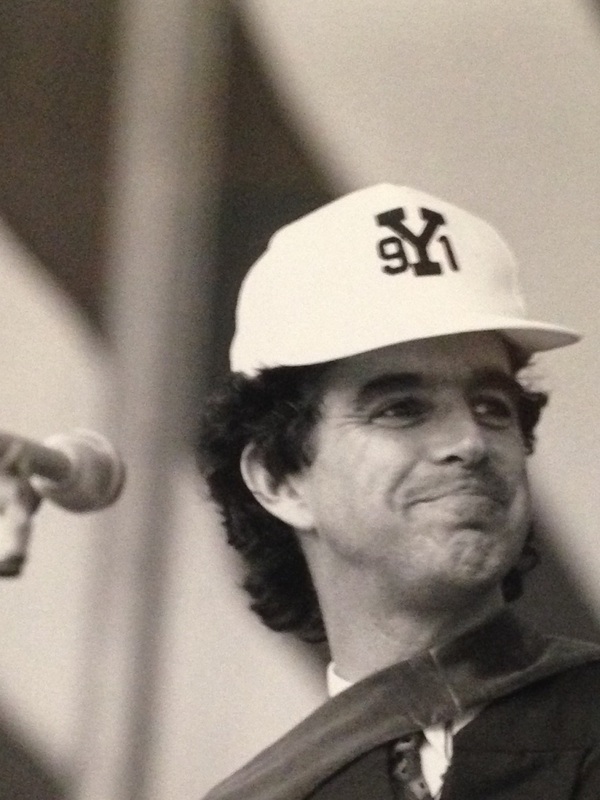 The Class of 1991 invited Doonesbury cartoonist, and member of the Yale College Class of 1970, Garry Trudeau to give its Class Day address. Trudeau began cartooning while a Yale undergraduate, and contributed the strip Bull Tales, Doonesbury’s precursor, to the Yale Daily News. Garry Trudeau (Class of 1970), Class Day speaker, May 1991. Photograph by Mike Marsland. RU 690, Accn 2009-A-070, Box 12. My advice to you: make a break for it. Take off. Cut your own swath. Stride out from under the longest shadow ever cast by a generation. Ask your own impertinent questions. There are many at hand. Wonder aloud what war is like for all its participants. Check out the accounting, what it cost us as a nation. Was it the same war for you as it was for the Army engineers who, away from the cameras, bulldozed 100,000 dead conscripts into the pits left by collapsed bunkers? Wonder, too, about the homefront agenda that got overlooked; the energy policy that may have made the war inevitable; an environmental agenda that has been all but abandoned; a business culture so moribund that even 70% of the high-tech components used in our Gulf War weapon systems were produced in Japan. These questions, when given a public voice, are all part of the ongoing dialogue between those who lead and those who would be lead. Ours is a system whose very vitality depends on its raucous dissent, its competing visions of how it should work. America is still very much a work in progress, and one of the things that has always distinguished it from other countries is that we’ve always been open to reinventing ourselves for the common good. One interesting bit of contextual information. The day after Trudeau’s Class Day speech, at the Yale’s 1991 Commencement exercises, then-President George H.W. Bush was given an honorary Doctor of Laws degree by Yale University. The Center for Science and Social Science Information, the Yale Center for Research Computing, and the Yale Digital Humanities Lab are excited to announce the schedule for the upcoming Yale Day of Data. The theme for 2016 will be open data, open software, reproducibility initiatives, and replication. On Thursday, December 1, we will have workshops, discussions with keynotes, and a poster session related to data and reproducibility. The poster session will highlight work by Yale students and researchers. Poster submissions are due by September 30. Friday, December 2 will include presentations and lightning talks that focus on open data, open software, reproducibility initiatives, and replication, along with keynote speakers. Applications to give a talk are due by September 15. Undergraduates, graduate students, faculty, and staff are invited to apply to present their work on December 2. Presenters give 20 minute presentations about their projects to a general audience, highlighting the themes of the day in relation to their work. Presenters give 5 minute overviews of a topic relevant to the theme, including discussion of projects, tools, methodologies, and more. To stay up to date, please join the Yale Day of Data mailing list, where we release our updates first. Registration will also be announced first on the mailing list. See http://mailman.yale.edu/mailman/listinfo/dayofdata for more information or to join. The Digital Humanities Lab welcomed junior high and high school students from around the New Haven area for a workshop on DH. Following a tour of the lab and a discussion of old and new media, students learned about the Photogrammar project and participated in a scavenger hunt to find images of American life during the Great Depression and World War II. The workshop was led by Catherine DeRose (Outreach Manager for the DHLab) and Lauren Tilton (PhD Candidate in American Studies). On Monday, May 23, the Sterling Memorial Library (SML) nave will host the President’s Commencement Day luncheon for honorary degree recipients. As a result, SML will be closed to the public until 3:00pm. It will reopen at 3:00 pm until 7:45pm. The temporary Beinecke Reading Room and Manuscripts and Archives – both located in SML – will be closed for the entire day. Bass Library will be open during its usual hours of 8:30am to 9:45pm, although the tunnel between Bass and SML will be closed until 3:00pm. Because Commencement can be a heavy book-return day, the book-drops outside of SML will remain open until 3:00pm, after which books can be returned inside the building. We apologize for any inconvenience and thank you in advance for your understanding. Details of access for library staff using SML on Monday have been communicated directly through the library staff email list. The Yale University Library is delighted to announce the appointment of John Gallagher as the new director of the Harvey Cushing/John Hay Whitney Medical Library. John joined the staff of the Yale Library in 1999 as a library services assistant in the Library Shelving Facility. He moved to the Medical Library in 2000 where he took the position of evening & weekend circulation supervisor, and was quickly promoted to the head of the circulation department. After completion of his Masters of Library Science in 2004, John was promoted again to the head of Access and Delivery Services. He was instrumental in pioneering and establishing the Scan on Demand service at the Cushing/Whitney Medical Library, which evolved into the Scan and Deliver service for the wider Yale Library system. He served as the library liaison to the Department of Orthopedics and Rehabilitation and co-chaired the library’s joint Department Committee for Best Practices, a university-wide initiative to foster and promote better management/labor relations and collaboration through interest-based problem solving. During this time, John also chaired a management/labor Access Services Assessment Task Force that reduced check-in errors at all libraries. As deputy director for Public Services and later associate director, John oversaw the completion of a number of major medical library renovations, including the Historical Library’s rare book stacks and staff areas, the construction of a secure reading room, and the construction of the Cushing Center. In 2012, John was selected to participate in the National Library of Medicine/Association of Academic Health Sciences Libraries’ Leadership Fellowship Program. John's participation in this prestigious and highly competitive program gives testimony to the quality of his leadership abilities. Susan Gibbons, University Librarian and Deputy Provost for Libraries & Scholarly Communication commented, "John’s appointment is fantastic. Not only do we add a talented colleague to the library’s senior leadership team, but John’s career demonstrates the opportunities for career advancement at Yale University Library." New bottle filling stations have been installed in Sterling Memorial Library’s Wright Reading Room and in the Thain Cafe! Members of the Yale community will now have access to filtered water while working in the surrounding spaces. The stations, which also count the quantity of plastic bottles saved from waste, are meant to reduce environmental impact by encouraging the use of reusable water bottles instead of disposable plastic bottles; and to make it easier for people to use re-fillable water bottles in the library. The library decided to install filtered water dispensers after a current graduate student made a suggestion through AskYale. Accessible through the Yale Library’s website, AskYale allows students and other members of the Yale community to ask questions and communicate suggestions. Yale Library encourages feedback, and endeavors to examine and respond to student needs. Have a question or a suggestion for the library? Visit AskYale And, be sure to check out the new bottle filling stations! The Digital Humanities Lab is excited to announce a new round of Seed Grants to support digital humanities research over the summer and fall. These grants may be used to hire a developer, create a digital corpus, or host a workshop. Yale graduate students and faculty are eligible to apply. Applications should be emailed to dhlab@yale.edu by Friday, May 27. DH Developer Douglas Duhaime will lead an informal, two-part workshop on creating distribution plots in R to visualize word frequencies. In Part 1, participants will learn how to create a plot based on a single text file. In Part 2, participants will incorporate facet wrapping into the code produced during Part 1 in order to plot "small multiples" (this is what you would do if you had more than one text file you were working with). To structure the workshop, we will be referring to Chapter 4 of Matthew Jockers's Text Analysis with R for Students of Literature. For Yale affiliates, the book is available electronically via Springer Link. A print copy is also available for reading in the DHLab. All are welcome; no programming experience is required! Participants should bring a laptop with them to the workshop. Prior to the workshops, participants should download R and RStudio. Please also install the package "ggplot2" in RStudio. Sample text files will be provided, but participants are encouraged to work with their own data during the week between the two workshops. Click "File" in the top header and select "New File -> R Script"
Email dhlab@yale.edu with any questions. The Yale Center for British Art reopens this week after a multi-year project to conserve its iconic building designed by Louis I. Kahn. The galleries have been refreshed and new spaces for study and teaching have been created. Accessibility of the building has also been improved. The collection has been reinstalled under the theme Britain and the World and includes over five hundred works tracing British art from the Protestant Reformation to the present. The two-floor installation examines the impact of foreign influences on British art and the role of the arts in Britain’s imperial activities. Opening events happened throughout the day on Wednesday, May 11th; a full-day community event is planned for this Saturday, May 14th, with film screenings, tours, activities, and music. You can also stop by and see our colleagues at the Yale Center for British Art Reference Library and Archives from 10am-5pm! For more information, see the Yale Center for British Art’s website at http://britishart.yale.edu/. Interested in exploring how you might incorporate DH methods and tools into the classroom to change the way your students interact with and think about humanities materials? Please join members of the Center for Teaching & Learning and the Yale Digital Humanities Lab for the "Integrating Digital Humanities" workshop, part of the upcoming Course [re]Design Institute series. In the workshop, we will discuss when and how an instructor might rework an existing assignment (or create a completely new one) to include a DH component. Please bring a syllabus or class assignment on which you would like to work to the session. Lunch will be provided. To sign up, please email Yvette Barnard in the CTL at yvette.barnard@yale.edu.